Minivans may not be the most exciting cars around, but as exemplified by today's Nice Price or Crack Pipe Dodge Colt Vista, they don't have to give up style for capaciousness. The question is, will you find this one's price to be too much to give up? The Battle of Britain was fought once again yesterday, only this time with a little help from the Americans - er, the Germans. That's because the Ford 2.8-powered 1966 Spitfire emerged from the fray victorious, with an 81% Nice Price win. It was, you might say, its finest hour. Fine and Minivan are two words that you don't normally piece together in a single sentence other than FINE, we'll take the minivan, but the Porsche WILL start, I can promise you that. One look however, at today's two-tone 1991 Dodge Colt Vista and you might want to make an exception to that rule, and potentially forget about the Porsche. The three-row Vista provided a smaller, and more traditionally wagon-like alternative to Chrysler's home-grown minivans, perhaps targeting buyers who had an aversion to sliding doors. This one comes from the last year of that first generation and ticks off pretty much every option box you could want - 2-litre 4G63 engine, five speed manual gearbox, all-wheel drive and enough class to garner the primo valet spot at Applebee's. 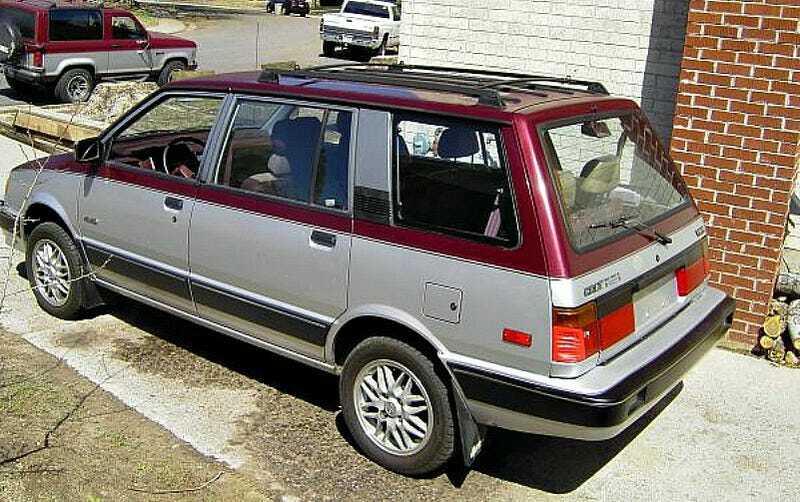 As I'm sure you all know, the Dodge Colt Vista was a badge-engineered version of the Mitsubishi Chariot - or Nimbus if you're from Australia, where it won the Wheels COTY award in ‘84. That origin makes it car-based, with the 98-horse SOHC four mounted transversely and the rear-drive being made available via a transaxle power takeoff. It also sports decent sight-lines, and a roomy, airy cabin plus an interior that's about as ‘80s as you can get. But the best part of this Vista is the ad. The seller, who appears to live in Denver Colorado, is seemingly suffering from the oxygen deprivation effects of that mile-high city which manifests itself as ALL CAPS syndrome and compulsive listification disorder. He also uses the term superior twice and divulges that one of his delights is a flat dashboard containing an instrument panel. Less delightful apparently is properly repairing a busted tail light lens. If you can make it through all that you'll discover that this Vista rocks but 88,000 miles on its clock, and has intermittent wipers. Classy! It also sports a red and brown interior to go with the merlot over silver paint job on the outside. That's complemented by what look like OEM wheels, but from some other OEM, and mud flaps on all four fenders. Oh, and it has overhead pushbutton reading lights! The seller also seems to be some sort of anarchist, only stating RESENT VEHICLE MAINTENANCE instead of the more typical question authority. In spite of that apparent bout of Ron Paulsey, he does note that the Dodge has had its struts and shocks, brakes, filters, tires, and plugs all recently replaced. I guess in reality he's a LINO. One of the things that really two girls my one cup is when somebody sets a price for something and then says that they are accepting offers over that amount. Um, yeah, eff that. Unless what you're selling is Selena Gomez-flavored popsicles then the way it works is by first setting a ridiculously high starting price, above what you'd realistically take. The prospective buyer then counters with an insultingly low response. This goes back and forth a few times until either you meet in the middle, or everything devolves into fisticuffs and eventually kissing. THAT'S HOW IT'S DONE. This guy doesn't get that, and it's now up to you to determine if he also doesn't get how much this Dodge Colt Vista is worth. The starting point for the offers he is accepting is $9,000 - what do you think, is that a good beginning for this Vista? Or, is that price a non-starter? H/T to Bigblockbear, for the superior hookup! For $3,490, Could You See Driving This Surprisingly Clean 1992 Plymouth Colt Vista AWD Wagon?